We make intuitive solutions that help shoppers adapt to using online grocery. Whether "spearfishing" for single items or using the "net" method to bundle products, we have solutions to help. 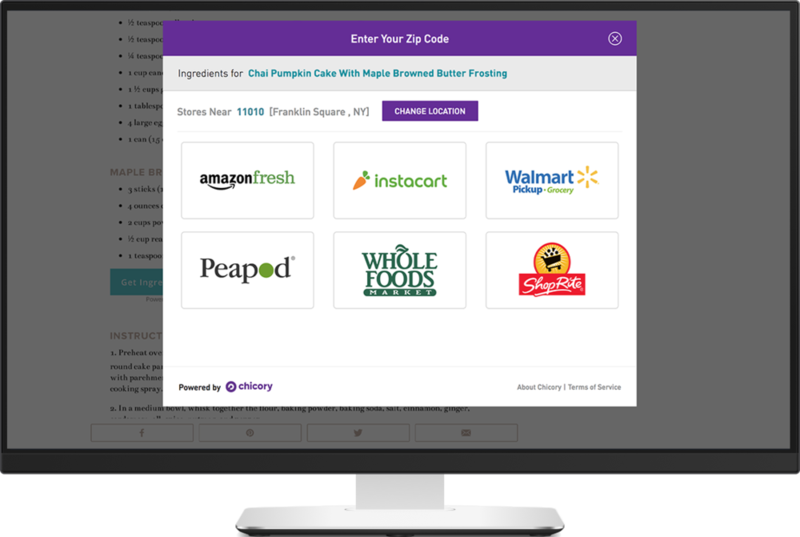 Work with Chicory to make your entire online recipe catalogue shoppable. When consumers click our “Get Ingredients” button, an online shopping list instantaneously populates with corresponding products from a suite of online grocers. Plus, we return a suite of insights to our partners, giving them direct insight into how consumers are shopping for their products online (geographic mapping of where products are purchased, top selected retailer and more). See why shoppable recipes are crucial for your CPG brand. Our tech turns any touchpoint into an ecommerce experience. When paired with our retailer integrations, we're able to drive online sales and engage shoppers like never before. Transform any media touchpoint into a one-click shopping engagement with Chicory Click-to-Cart. Or, license our links for shoppability anywhere. Available for single or multi-SKU. How can we help to amp up your ecommerce strategy? See how Chicory increased ecommerce engagements at Amazon for a health brand. Check out how Chicory helped a trade board equitably represent its partners. Find out how Chicory produced a 6.1% in-store sales lift for Perdue.